“That’s a photograph? !” they ask, astonished. The original photo, submitted to me by Richard. He had already sent me quite a few photos, but I saw the dual-colored suns on this and was immediately sold. I believe you CAN judge a book by its cover, and I also believe that something special about being an indie author is getting to decide what my covers look like. I think a cover should not only say something about the book, but also give insight into the author. And the only way it can do that is if the author actually picked it. I came across Richard’s work a long time ago when Colorworld was still a piece of crap draft, when publishing was merely a figment of my imagination. But when I began thinking about covers, Richard’s work was at the forefront of my mind. I am still humbled to this day that Richard agreed to work with me, to commit to producing 7 different bubble photos for each of the books in the series. He is indeed an extraordinary photographer, and a human being attuned to each minuscule moment of beauty the rest of us overlook in the hustle and bustle of life. He’s got something special. I encourage you to check out his flickr page (linked in the interview below). Every time I do, my breath catches and I fall in love with his work over and over. Below is an interview he agreed to do with me. It will give you a small glimpse into the dedication he has toward his work that I am privileged to partake in. 1) What made you pick up a camera to take your very first picture? I only really became interested in photography around 10 years ago, when I was 31 years old. I was working with hospital records at the time. I was based in a large warehouse that shelved all the records, and was set a project of writing a manual to help staff to find and retrieve different records. I realised that photographs of the records, the shelving, and the buildings would be really helpful. I had previously been an arts and Literature student, so I probably already had an artistic sense for structure and beauty, and I soon found that the aesthetics of photography really excited and interested me. In the records warehouse, packed out with shelving from floor to ceiling, I began to really appreciate the perspective lines of the shelving. I bought a cheap digital camera, and soon ended up carrying it everywhere I went, photographing everything I saw. It might seem strange that I should find a records warehouse so fascinating, but now that I look back at that time, I suppose that by photographing the warehouse I was in some way trying to make visual sense of somewhere that was a part of my life. 2) What’s it like to have you at an event? Do you stop the “show” to take pictures a lot? 3) Do you take pictures of your food if it looks really good? No, not really. I have photographed a Romanescu broccoli though. The broccoli has incredible fractal patterns, much like the seed heads of some flowers, such as Rudbeckia. 4) Is there something you take pictures of that you are either embarrassed to put on your flickr page or that you withold for some other reason? That’s an interesting question! I live in a small nineteenth century English town (Saltaire) that was designed to house workers for a mill. The town has now been preserved so that it keeps its original look and feeling. There’s a cobbled street, stone terraces, and many beautiful buildings. I like to photograph the streets in different weathers, in summer, in winter, when the light changes, or when the mist hangs low. But because I have become well known for photographing soap bubbles, many of the people who look at my flickr stream tend to expect photographs of soap bubbles, not street scenes. So I’ve now set up a separate flickr identity where I can upload photographs of where I live. 5) How did bubbles become your thing? Before photographing soap bubbles, I had taken close up photograph’s of my wife’s eyes. I became fascinated by eyes and spheres, and how it was possible to see and photograph reflections in eyes. My nieces were young girls at the time, and they began playing around with blowing soap bubbles. I then played around with soap bubbles too, and because I was attuned to looking at spheres and reflections, I began to look really carefully at the colors and reflections. I soon became quite obsessed with photographing soap bubbles, trying to capture the textures, colors, and reflections. As I experimented and learned, I uploaded my photos to flickr, and also searched flickr for other photographers’ bubble photos. Within a few weeks I realised that I was creating bubbles photographs that were right up there with the best that anyone else had created. I spent most days trying to photograph bubbles in my back garden, and one day a bubble just happened to pop while I was photographing it. That would normally have been a bad thing, because it would simply mean that the bubble had disappeared. But by sheer chance, I had managed to capture the moment of the bubble popping, and this made the photograph fascinating because you could see one side of the bubble breaking up into tiny water droplets. So I then set out to deliberately capture the bubbles popping, and by being lucky with the weather and lighting conditions, I quickly managed to capture 3 or 4 shots that caught the bubbles in various stages of bursting. These shots also captured my reflection, and the reflection of my wife as she burst the bubble with her finger. I proudly uploaded these photos to flickr, aware that that they were probably original and new, and definitely extraordinary. I received a lot of positive feedback from other flickr photographers, and then, within a few days, I started getting messages and emails from newspapers and magazines that wanted to feature my work. I received a lot of press attention for a few days, where my bubbles featured on popular TV programs such as GMTV and Good Morning America, in newspapers, and then magazines and advertising. Since then, I have gradually learned more and more about bubbles and photography, and have worked on various bubble projects. Being well known for photographing soap bubbles has led to many good things happening. One thing I particularly like is that photography students often base their coursework and projects on my photographs, and then contact me to ask questions. 6) Are there other things you love to photograph as much as bubbles or are bubbles your focus because of the overwhelming positive response to them? I go through phases of what I like to photograph, often depending on what’s around me at the time. I love bubbles, but I also love to photograph insects close up. I use a close-up lens that allows me to capture insects such as tiny spiders in great detail. Photographing insects is like entering into a smaller world that most people just don’t see or notice. It’s a brutal world too. A few years ago a Hummingbird-Hawk Moth was feeding on flowers by my kitchen window as I was washing up. It came back to the same spot day after day, which gave me the opportunity to get to know its behaviour, and to photograph it in different light conditions. Like a hummingbird, this moth hovers over a flower to feed on nectar, so it stays still enough to be photographed in flight. I captured some great photographs of it hovering, and was lucky enough to capture a rare moment when it got a tiny flower caught on its proboscis. The BBC featured these photos on a well known UK wildlife series (Autumnwatch), which pleased me more than I can express, because I love to watch this program. 7) How did you feel when your copy of Colorworld showed up and your bubble was on it? 8) With the “colorworld bubble” appearing in so many places online, how does it feel to have created such an iconic image? It is a great feeling to be associated with such a beautiful and iconic image. Creating this photograph is an achievement I am very proud of. Know that thousands of people will see this image and wonder at it…. That’s a feeling that warms me from the inside. 9) Of all the upcoming projects for later books in this series, is there one in particular that you are looking forward to doing more than the others? I get excited by close-up photographs of soap bubbles under bright sunlight, because the colors and textures can then begin to create what seem to be mini worlds, miniature planets. The colors and shapes can also appear quite abstract, so that you find yourself looking deeper and deeper into the photograph, trying to understand what you are looking at. I love that experience of looking into a photograph and experiencing layers. I love the photograph on the cover of Teleworld, for example, because the in and out of focus areas draw me deeper into the photograph. The photograph is three dimensional in that sense. The front of that close-up photograph has the iridescent colors of the bubble beautifully in focus, so that you can see the patterns on the thin bubble film. Close-ups are exciting in this sense. We will soon be working with close ups again! 10) For us, it was a no-brainer to use the bubble because it both conveys the image of a world and the colors meshed so beautifully. With this in mind as well as the themes we’ve talked about for each of the books in the series, has working with the books series changed how you see bubbles when you photograph them now? Reflecting the tree inside a bubble was special. I can’t easily find words to express how well that image works for me. 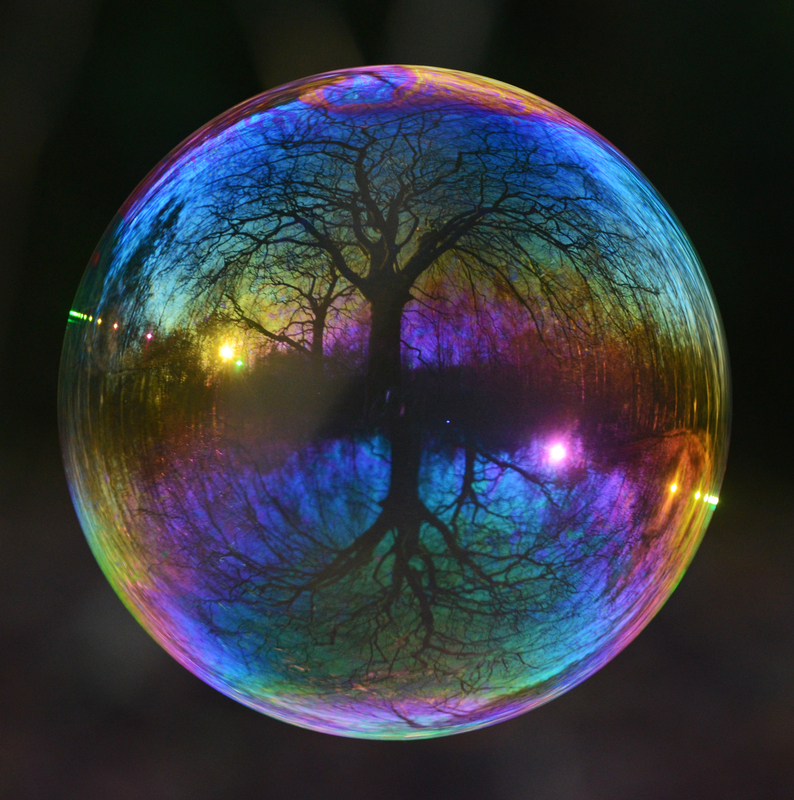 It no doubt has a lot to do with the sense that a tree is such a natural, familiar, and organic shape, and yet by being reflected inside a soap bubble, it now appears familiar and unfamiliar at the same time – as well as being bathed in all the colors of the rainbow. I spent perhaps more than 20 hours in forests trying to capture that photograph: searching for the perfect tree, waiting for the right light and weather conditions. While spending all those hours wandering around in forests, I increasingly realized that the overall concept (a tree inside a bubble) was so simple and beautiful. Reflecting natural things inside bubble is definitely something I want to develop and return too. I am now always looking out for a perfect tree to reflect in a bubble. I must return to trees again!